Nicholas Slottje has been with Charlesbank Realty Group since 2007 when he first served as Director of Real Estate and as CFO of affiliated retail businesses. In 2012 Nicholas was named as President and CEO of the firm. He has great experience in several sectors, development, investment and asset management across a range of property types. As President, Nicholas continues to guide the company's financial resources and key lender relationships, and works closely with the functional areas of legal, leasing and overall management of Charlesbank Realty Group. He continues to oversee acquisitions and dispositions, tenant relations and the company's important development/redevelopment strategy. In 2009, Nicholas along with his brother Spencer, founded Boston Harbor Holdings LLC., which is a real estate capital lending firm that specializes in niche and custom financing for real estate developers and investors. In addition to his duties at Charlesbank Realty Group Nicholas is also a licensed real estate broker in the Commonwealth of Massachusetts and a member of Beta Gamma Sigma which recognizes business excellence. Nicholas earned a Bachelor's degree in Corporate Finance & Accounting from Bentley University. He returned 3 years later to earn a Master of Science degree in Real Estate. 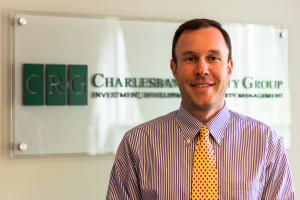 Before joining Charlesbank Realty Group, Nicholas worked in corporate finance and accounting as a Senior Analyst for Boston, Mass. based Teradyne Inc. Nicholas resides in Massachusetts with his wife Jennifer and two children. 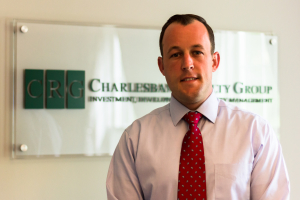 Spencer Slottje serves as CFO of Charlesbank Realty Group. In addition to his financial guidance of the firm he is also responsible for all day to day operations and physical property management. Spencer is also a partner and active member of Boston Harbor Holdings, the firm's capital lending division. Spencer also manages all accounting processes and also oversees the maintenance division for CRG. Spencer travels in order to oversee property and manage the portfolio in NY and PA. Prior to accepting his position as CFO and the founding of Boston Harbor Holdings in 2009, Spencer served as the Managing Partner / Buyer for a family owned and operated retail chain. Prior to that Spencer worked for Advantage Sales and Marketing of Foxborough, MA where he helped manage and oversee a distinct variety of grocery lines across the New England region for a privately held grocery chain, Demoulas Market Basket. In 2007, Spencer received his Bachelor of Science Degree in Business Management from Roger Williams University in Bristol, RI. Spencer resides in Massachusetts with his wife Sarah and their two children. Copyright © Charlesbank Realty Group. All Rights Reserved.